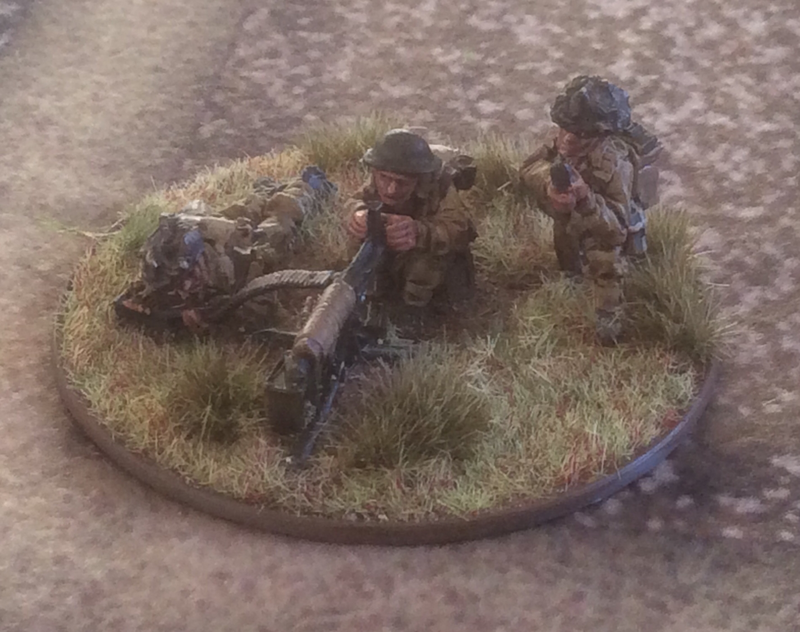 I try to arrange a couple of multi player wargames a year and have started thinking about a theme for the next one. Choice of period mostly depends on what I have read most recently. This time I have gone Napoleonic, as I am thoroughly enjoying John R Elting’s Swords Around a Throne. This period is also a reliable choice for most other players. Sam Mustafa’s Blücher rules have proved a good set for our multi player games, being easy to learn yet still atmospheric and satsisfying to play. 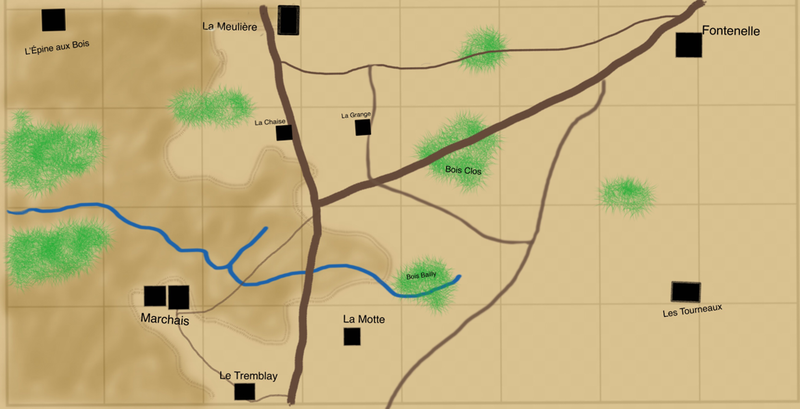 I have selected Montmirail, 11 February 1814, the middle and largest engagement of the 6 Day campaign. We played and enjoyed it in the 1990s using Napoleon’s Battles. 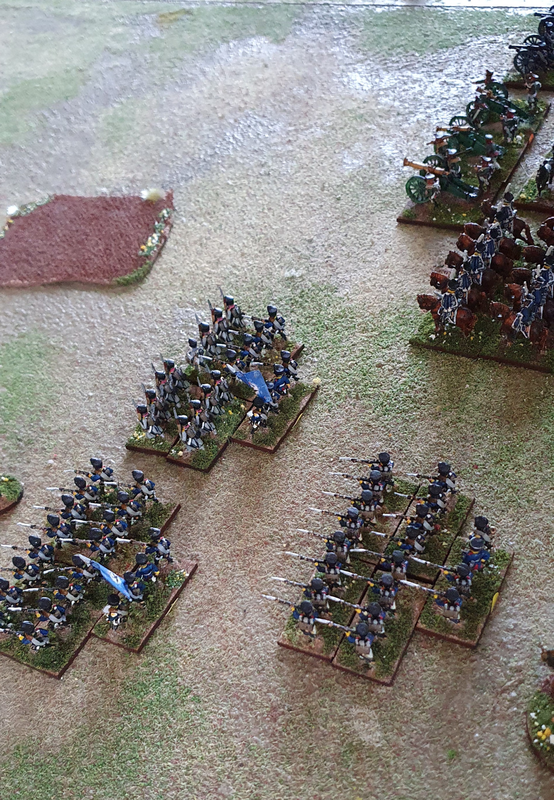 It is a three way battle with the French heavily outnumbered at the start, with numbers increasing through the day. It is also notable for the preponderance of Guard units in the French army so actually gives you a chance to use all those guard units in anger. I started with F Loraine Petrie’s Napoleon at Bay, a clear and balanced analysis of the campaign. I also have the French language Napoleon, 1814 by Jean Tranié and JC Carmigniani. 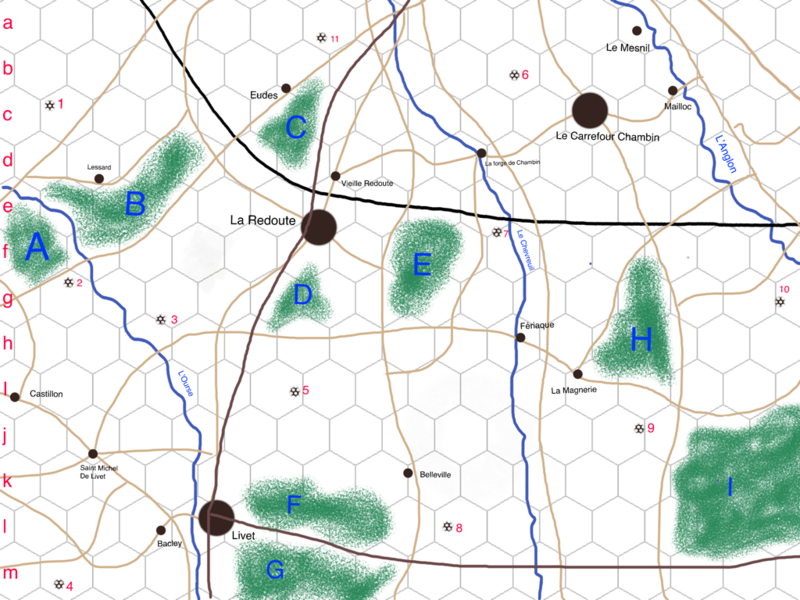 On line, I found an excellent source called les batailles, website address http://www.lesbatailles.com/page9/page9.html. This has a detailed and careful account with extensive orders of battle and clear maps. The Wikipedia article on Montmirail is ok but this includes some mistakes about the units present and its account of the battle is less clear. 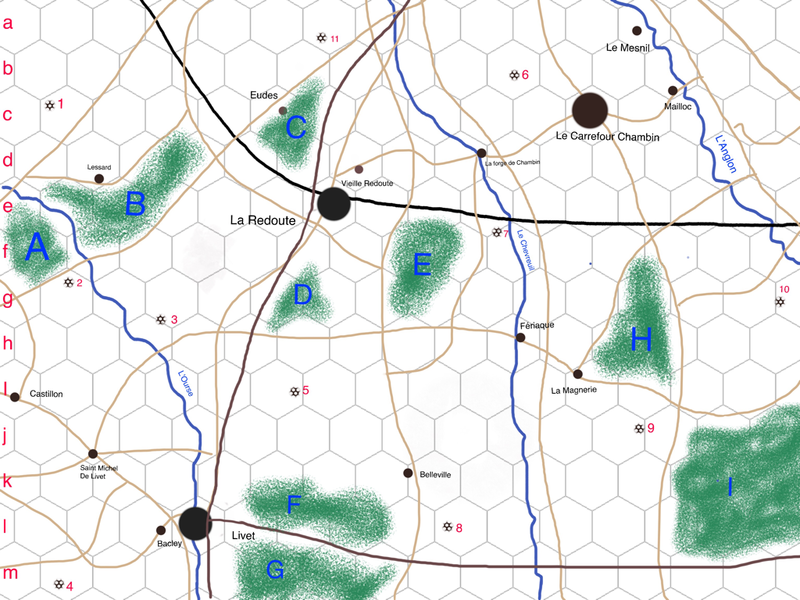 At the standard Blücher game size, Montmirail comes out as a small engagement with few manoeuvre units on either side. But using the option for small scale scenarios, it becomes more interesting. Sam Mustafa is not worried by the constraints of fixed ground and time scales in Blücher but I still want a framework for scenario planning. Fortunately his previous grand tactical set, Grande Armée, was clearer on these issues so when Blücher is unclear I refer back to them. Since this is a small scale battle I settled for 1BW to equate to 150 yards. For time, I decided one hour would be represented by 4 game turns each. This is important for planning the arrival of reinforcements. The playing surface came out as follows on an 8x4 feet table, with 1BW of 150 yards being 3”. 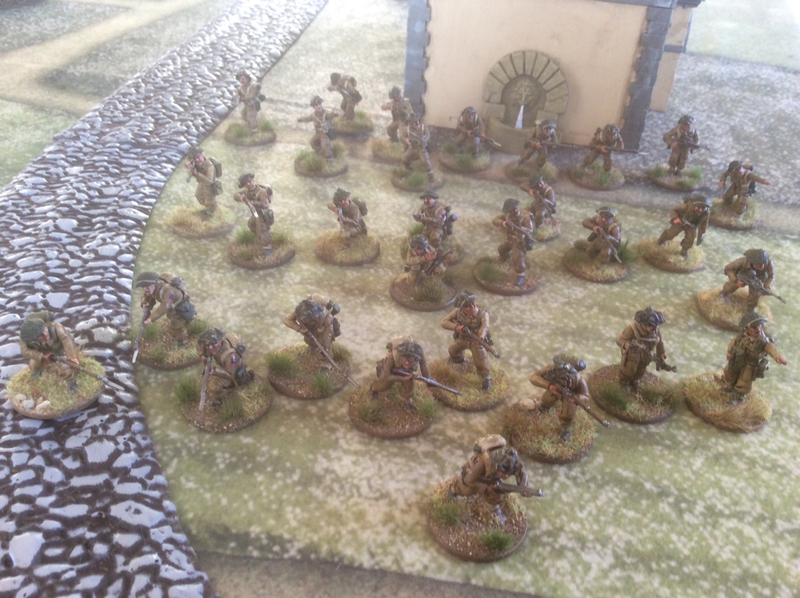 The Allies deploy at the top of the table and the French reinforcements arrive at the bottom. 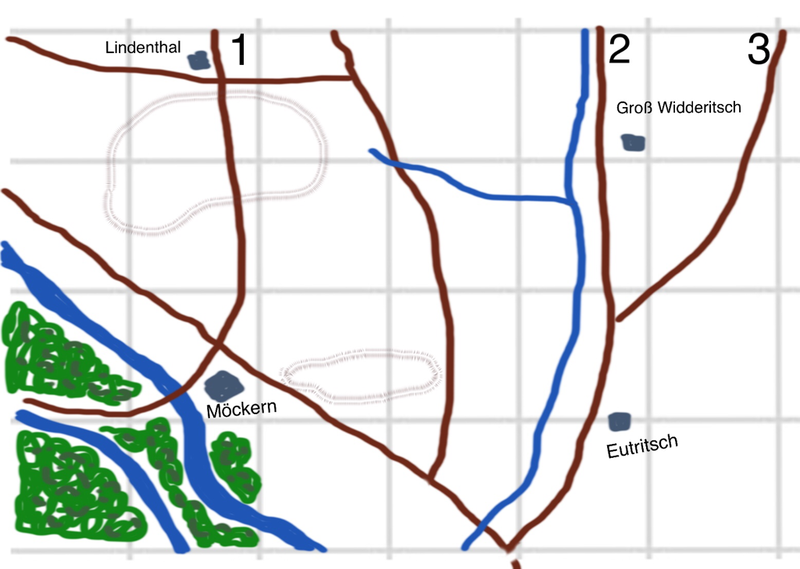 The grid is read as lettered columns and numbered rows (thus, Fontenelle is in box G1). The darker areas to the left are lower than their surroundings although the only time this matters is when units cross the contour line. Creating a reliable OOB is difficult at the best of times but even more so for 1814, when some Allied strengths had fallen drastically and bookkeeping for all armies, but especially the hastily assembled French forces, was sketchy. Accounts differ radically but I decided to trust the Batailles website as this seems very well sourced and argued. It also, to be frank, produces a game OOB that seems nicely balanced, which is important for player satisfaction. I accepted the seemingly majority view that there was no Young Guard at the battle. Marshal Ney, commander of the Young Guard, was present on his own and led Friant’s division with distinction, but his young guardsmen were several kilometres short of the battlefield. 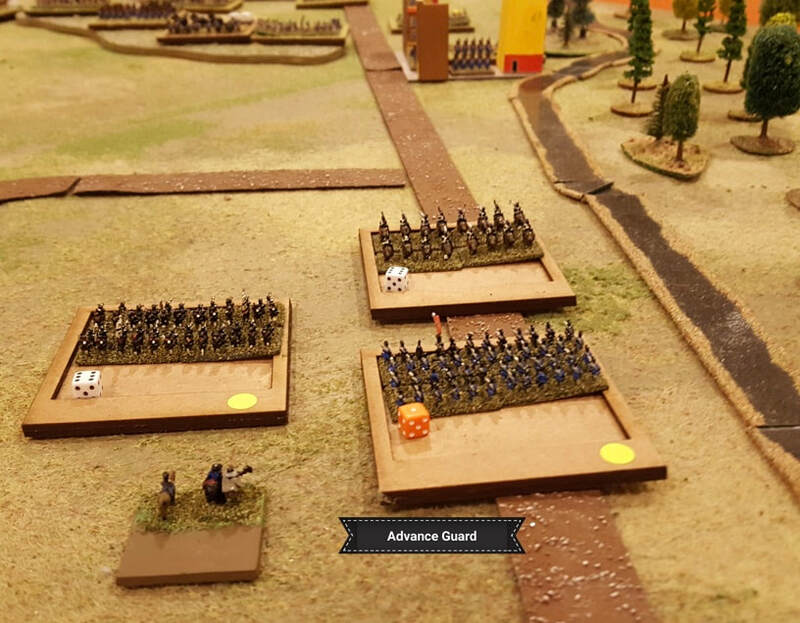 In the next post I will discuss choice of figures, summarise the events of the real battle and upload the final scenario. While in Devon last weekend I played a game laid on by Keith, my ancient and constant wargaming opponent. 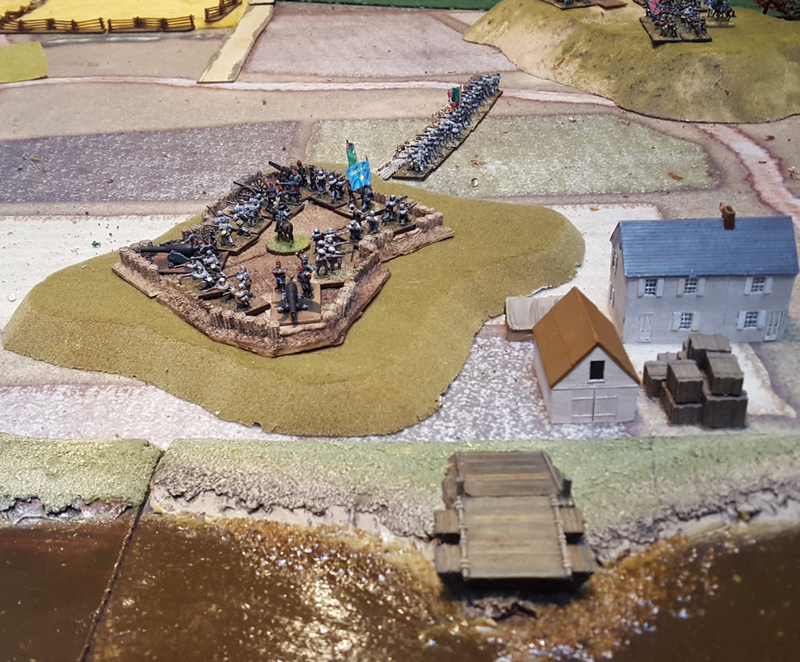 He had set up a scenario for Longstreet, adapted from Warlord Games’ Glory, Hallelujah! ACW supplement, in which a Federal force of two divisions has the job of capturing a Confederate-held riverside fort, itself supported by two field brigades. I think the original scenario is called Wright’s Farm. I took the Confederates and Keith the Federals. Both of our break points, based on my outnumbered force, was 44. If Keith captured the fort, it would be worth an additional die towards rolling for my demoralisation. Keith had the option of bringing a steamer down stream to bombard the fort, although this would bring it in range of my heavy guns. Keith set up on a chain of hills overlooking the fort. I put a regiment in garrison with four heavy rifled artillery pieces in the fort on my left. 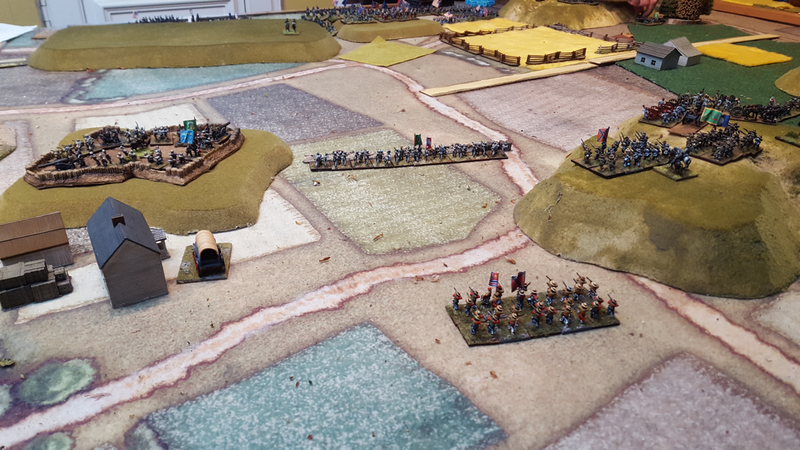 The valley between the fort and the hill in my centre was filled with an entrenched regiment, then I placed one brigade in the centre and the last on high ground on my right. The frontages of our two forces were therefore about equal at the start, although Keith was deployed in more depth. The fort commanding the river. In summary, the game began with Keith marching out all along his line, with a little more pace on his two flanks. His right wing assaulted the fort three times and each attack was repulsed. 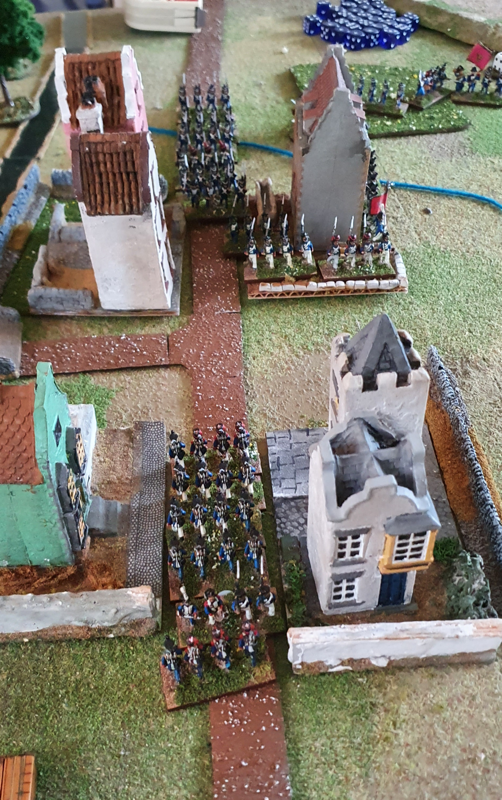 On his left, shortly before his line came within small arms range, I withdrew my right hand brigade and started moving them to reinforce my centre and left. I wanted the Union left flank to land its punch into mid-air and then be too far away to affect the fight for the fort. This nearly worked perfectly except Keith played a Confusion card on my rearmost regiment, which allowed him to catch and maul it. Apart from this I was pleased with the timing and execution of the withdrawal. In the centre, Keith’s initial intention had been to screen but he attacked four of my regiments at the same time as his last assault on the fort. This turn increased my losses but my line held. 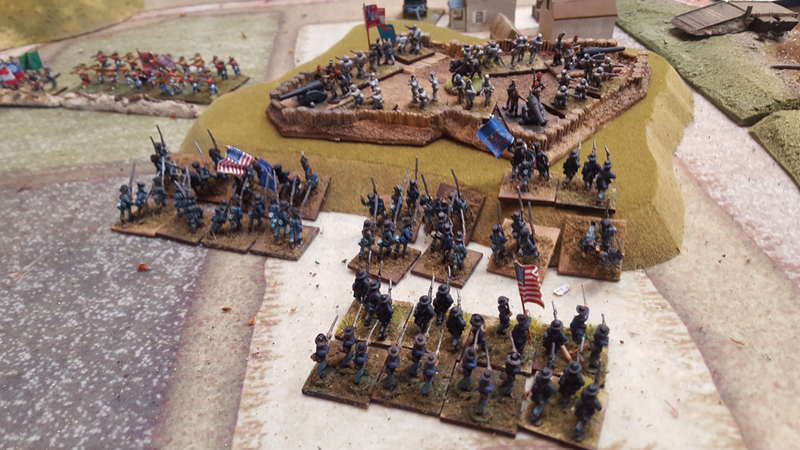 Shortly after, a very successful round of Confederate shooting pushed Keith over his morale limit and the game ended. The steamer never arrived to bombard the Confederate shore. This was a tense and fun game. I didn’t fancy my chances at the start since I was so heavily outnumbered but the fort was tough and I was able to inflict a lot of damage on the assaulting troops as they closed. As ever, the Longstreet cards dealt some memorable incidents that few other rule sets can allow unless they have an umpire. Foremost was the catching of my retreating right wing, which I would not have allowed to happen without the interference of an Interrupt card. Keith also inflicted a ‘couldn’t hit an elephant’ card (ie general hit by enemy fire) that removed 5 cards from my hand in one terrible turn. The Longstreet cards are a finely balanced device, keeping uncertainty high but never overwhelming the mechanics with too much arbitrary luck. Throughout a game, you still play your opponent rather than the system. I have said this before and it is still true: Longstreet is my favourite rules set, for any period. These simple, taut and flavour-filled rules are just masterful. Longstreet is quite hard to come by these days, at least in the UK. That said, the introductory rules and cards are still available to download for free on the Honour Games website. 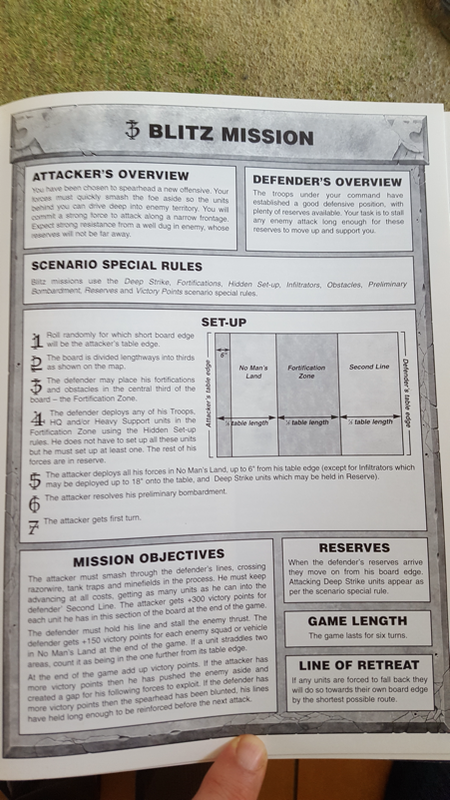 The combat rules are only slightly less comprehensive than the main rules, although they lack the campaign system. But the free rules and cards are still a great starting point. The third and last unsuccessful assault on the fort. The figures were from Keith’s 15/18mm collection, mostly by Peter Pig. Buildings by Timecast and cloth by Cigar Box Battles. Moises has asked what became of my planned Bolt Action British force that I was building in 2016. I have collected pretty much everybody I need for a reinforced platoon. I like to play them as regulars, with three full ten-man sections. The MMG appears in most games along with the PIAT, although I have not so much as dented a German tank with one yet. I also tend to take one or both mortars, which rarely kill many enemy but do oblige them to change position, which is useful against a well placed team weapon. I also picked up the Warlord sniper in a gilly suit, mainly because it is such a lovely model. Also, while I like the 6 pdr, I don’t field it too often as unless I am expecting to defend against armour, it is rather too easy to ignore. I have used the Bren carrier to carry weapons teams, which adds some mobility. 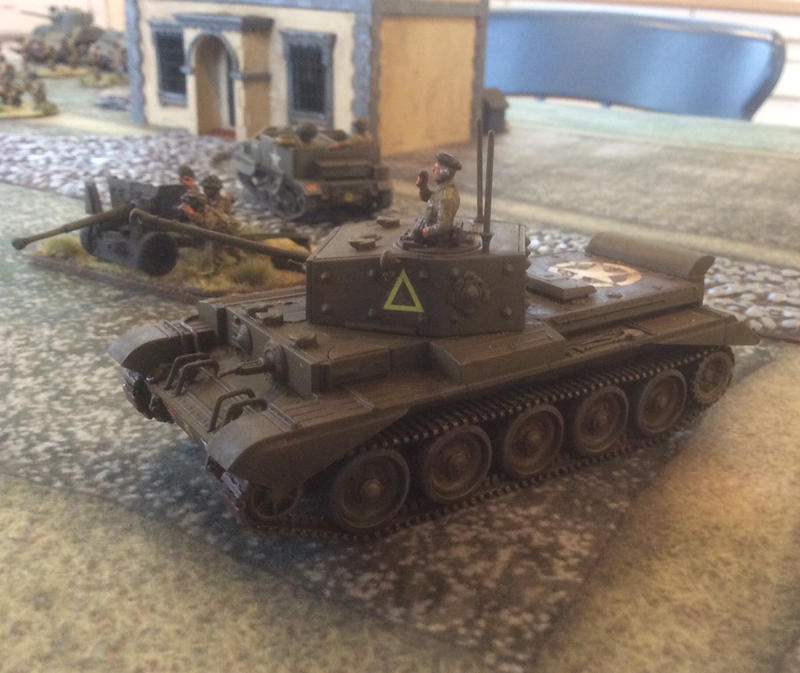 The Cromwell has come out from time to time but represents a big investment in the size of game we mostly play. 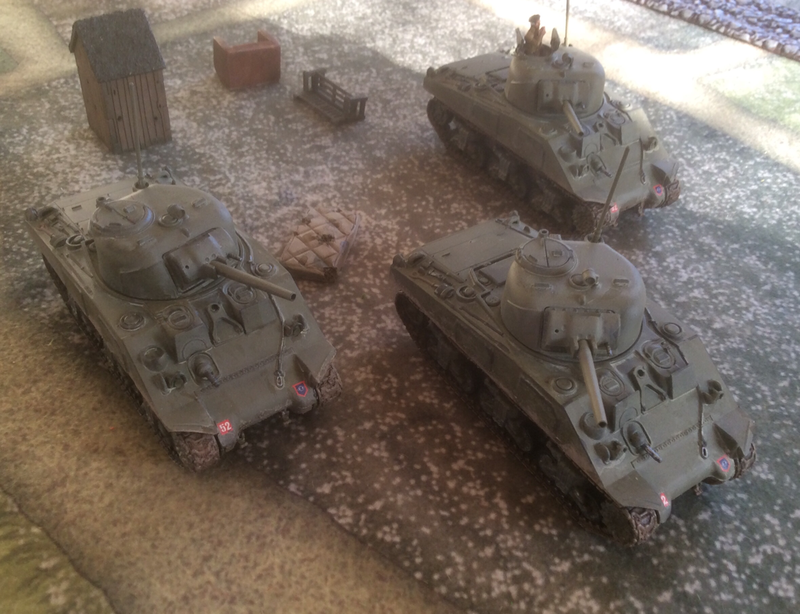 In a mad moment I bought the TankWar starter set so also have three Shermans painted as Guards Armoured Division. They have only seen action in a few Tank War games but I like to know they’re there. I don’t have ambitions to add to the army at present, except to get some new Bren teams if I find some I like by another manufacturer. I just can’t get excited about the plastic Warlord Bren teams: they are too hard to distinguish from the other plastics. I’d like some Bren teams firing prone or something similar. I have also got an M10 Achilles waiting for assembly. I don’t exactly need it but I’ve liked the Achilles since I had a Minitank model of one many years ago. I like to build both sides for a period so have a late War German force, that again is about at its limit I think. As Matt, my most frequent current opponent, runs Americans, I have tended to play the Germans more often than the Brits for some time now. But after getting these lads out of the toy cupboard, I’m thinking they need another outing soon. 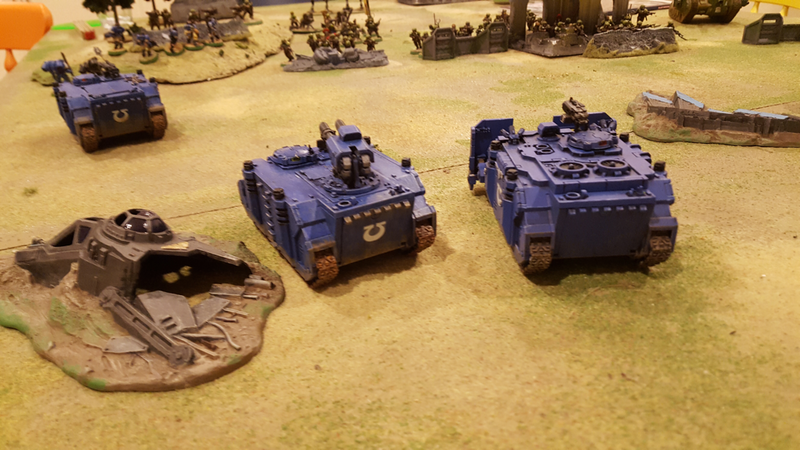 Over the Christmas break, my son Nick and I managed a nostalgic game of 40K. It was great fun to be back in the grim darkness of the far future. 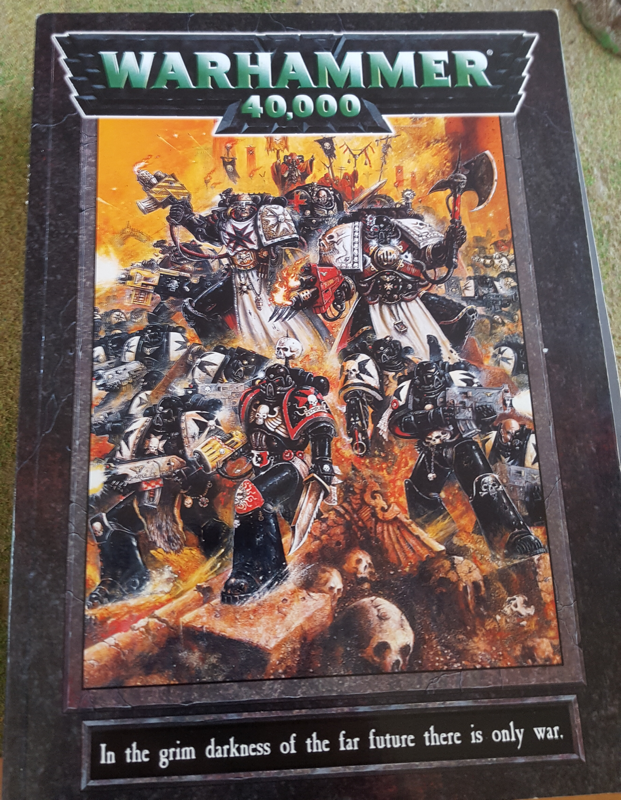 Between 1997 and about 2010, we played every Games Workshop game on the market, picking up each new edition and army as it came out. After a few years Nick’s younger brother Will joined in, becoming a very fine painter over time. We drifted away from GW around the release of Age of Sigmar. I greatly regretted the destruction of the Warhammer world, which had been such a rich environment for campaign games and fiction. I just couldn’t get excited about the Age of Sigmar storyline or rules. But we didn’t consciously decide to stop playing GW: we just found ourselves playing fewer wargames and when we did, we played more historical rules. 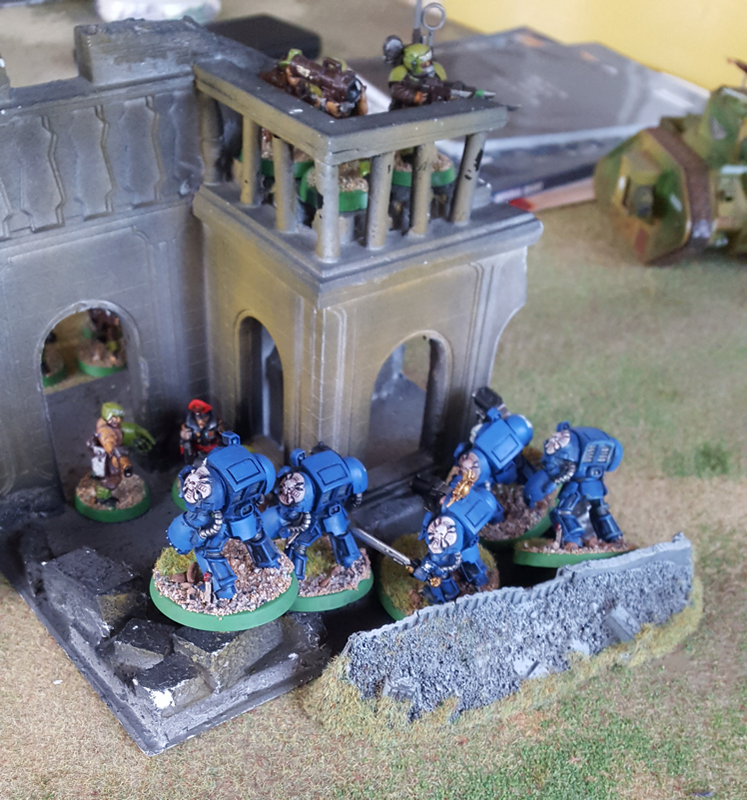 We have played the odd game in recent years, particularly enjoying a multiplayer Epic 40k game in 2017. But this Christmas was our first return to GW since then. Although we do have every edition up to the sixth, we decided to play fifth edition, as we remembered this set best and our figure collection stopped growing at that time. I took Ultramarines and Nick chose Imperial Guard. We chose the Blitz scenario from the third edition rules, which required me to break through Nick’s line in an attack down the length of the table. We played this a few times in the old days and it was especially fun with Imperial Guard on the defensive. We had 1,500 points apiece. I took a unit of terminators thinking they would deep strike, but in the 5th edition Space Marine codex this isn’t possible so instead of landing in the enemy’s rear, they had to shlep up from my base line (believe me, I searched the codex from cover to cover). I also took some scouts and scout bikers because I love the models, but the bikes in particular were a poor choice against a solid defence line. My vindicator was a more sensible selection, along with a razorback and a rhino. Nick meanwhile took a solid force with lots of lascannons, a Leman Rus and some Kasrkrin who could (of course) deep strike. I sent my main force up the left, hoping to pin Nick’s left with the terminators. They sort of did their job and when they closed with the enemy line they were unstoppable. 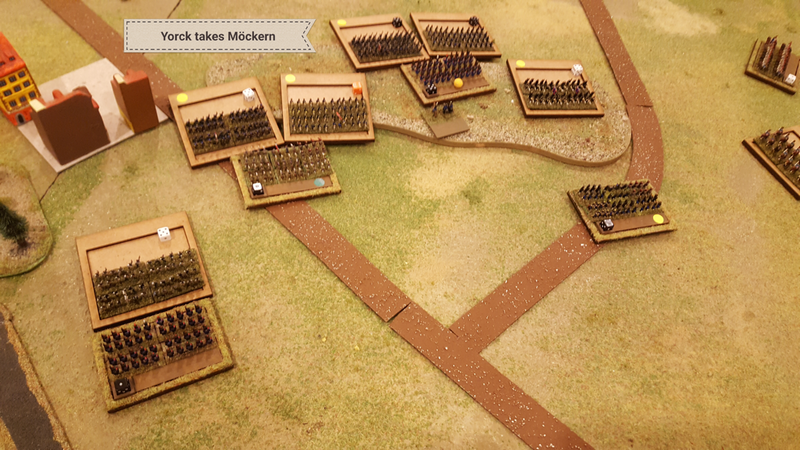 However, while they trundled forward, slowly losing men, Nick managed to rip my main assault apart. In particular he dropped his Kasrkrin at the right time and point to destroy my command squad with their fire. In the same turn he took out my vindicator with a lascannon-armed sentinel. I decided to debus my tactical squad to deal with the Kasrkrin and shot them up pretty effectively but at the cost of my only chance to get into the enemy rear area. The game ended after turn five with Nick’s centre dented but still in a coherent line and my objective categorically not achieved. We really enjoyed our return to the grim darkness. We both love the back story of the Imperial Guard, pitting their unaugmented strength against supermen and aliens. 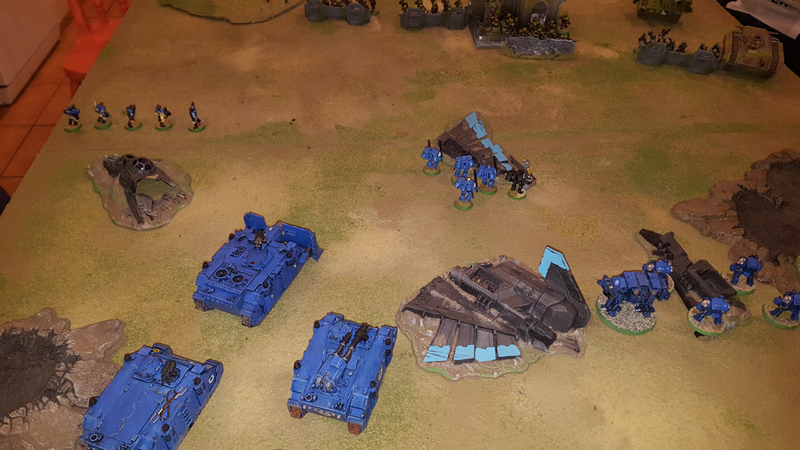 This game showed how a good position, investment in heavy weapons and wisely used counterattack capability can spoil the Ultramarines’ day. I am sure we will return to 40K from time to time but I don’t feel a need to upgrade to the latest rules. Although... it might be fun using an edition that allows terminators to deep strike. I have had another go at the house rules for adapting FK&P to Eastern Europe. For now we are just looking at the troops needed to refight the battle of Berestechko in 1651, so involving the Polish Lithuanian Commonwealth, Zaporozhian Cossacks and Tatars. When we are happy with these I’ll have a look at Muscovy. The current house rules are here . This is a lot of fun to do. Poor Matt is going to find himself in the gaming equivalent of Groundhog Day before we are satisfied. 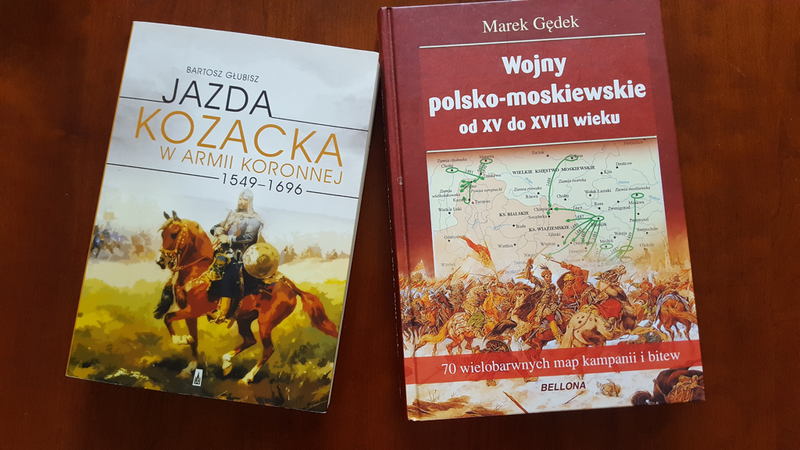 In a recent blog comment, Neil Burton asked if I could provide some sources for warfare in 17th Century Eastern Europe. 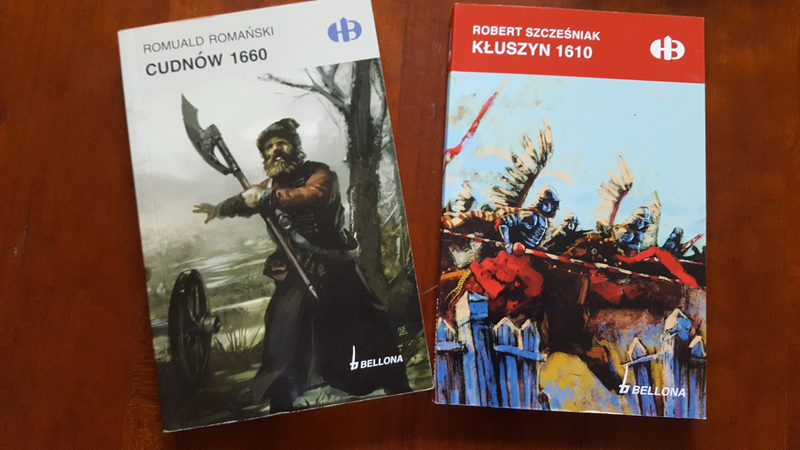 I’m afraid most of my detailed sources are in Polish but there are some useful Ospreys and a growing collection of material in English on the Intranet. Polish Armies 1569-1696, by Richard Brzezinski, is published in two volumes by Osprey (numbers 184 and 188 in the Men-at-Arms series). Volume one concerns the ‘national’ Polish formations and volume two is about the ‘foreign’ section. The illustrations by Angus McBride are particularly good. These books only suffer from the limitations of the format: while a great introduction, they barely scratch the surface of the wars of this period. 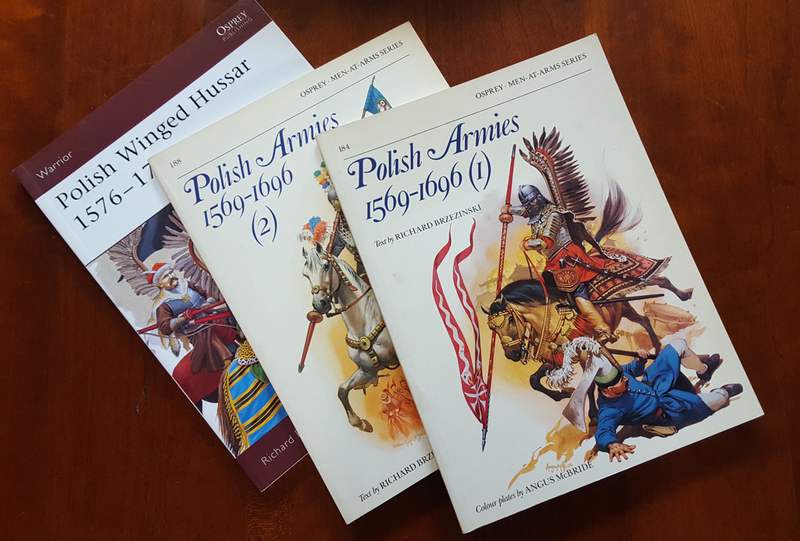 Richard Brzezinski wrote another useful book for Osprey in the Warrior series, published in 2006, called Polish Winged Hussar 1576-1775. Another really helpful source of information are the rules With Fire and Sword, by the Polish company The Wargamer. They provide lots of information about the different troop types as well as campaign backgrounds and tailored orders of battle. I am not attracted to the rules themselves but they are still worth getting for the background material and illustrations. On the Internet, there is a lot of English language material on Wikipedia. The following links are good starting points and each will take you to several other useful pages, especially about battles. The following site is dedicated to Polish renaissance warfare. The last site to recommend is the home page of a re-enactment society, which contains a varied mix of useful articles, from dress and equipment to discussions about tactics. I have spent a lot of time on this site and really enjoy searching it. 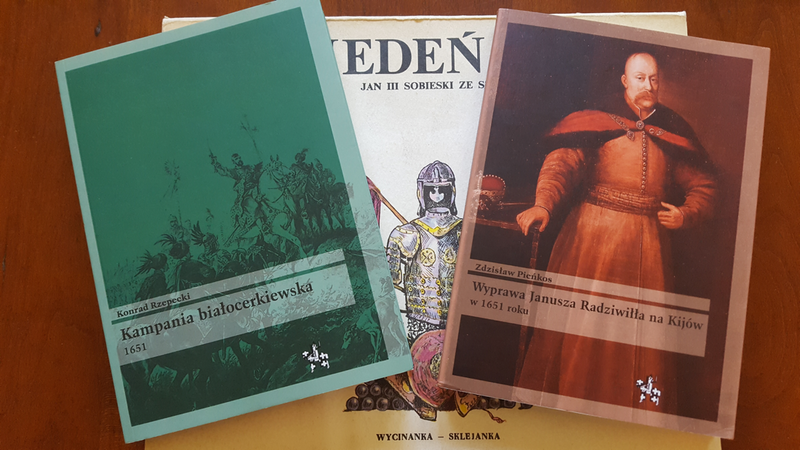 In case you speak Polish, these are books I have picked up for myself in recent years. New titles appear regularly and it is worth entering the name of a battle on Amazon to see what comes up. I found the two books about Cudnów (1660) that way. i wish this period and theatre was easier to access, since I find it so fascinating. But by looking here and there across the Internet, you will find a great deal of interest. On 15 September, Keith, Matt and I spent more money than was good for us at Colours in Newbury. I like this venue, especially the light upstairs floors that are a much more pleasant environment than some Show venues. 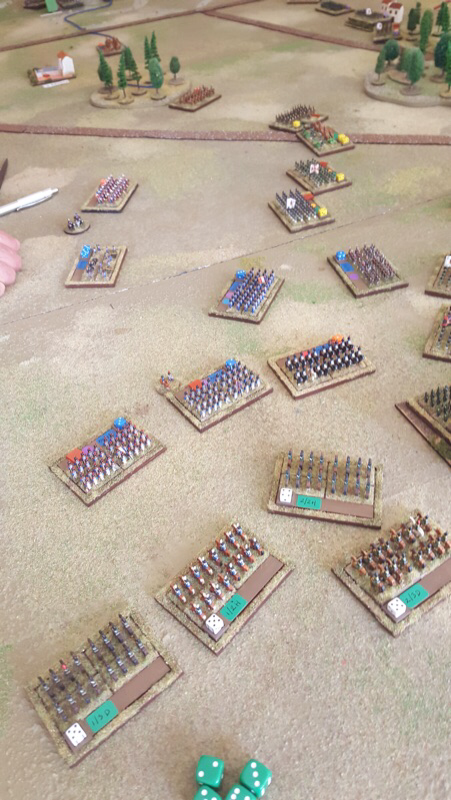 On the second floor, messrs Miller and Brentnall were demonstrating a beautiful 28mm game of For King and Parliament. Having left the dog home alone, I prevailed upon Keith and Matt to leave Colours at lunchtime and come back to play a game. We agreed to try the new stats I have been brewing for using For King and Parliament in Eastern Europe. 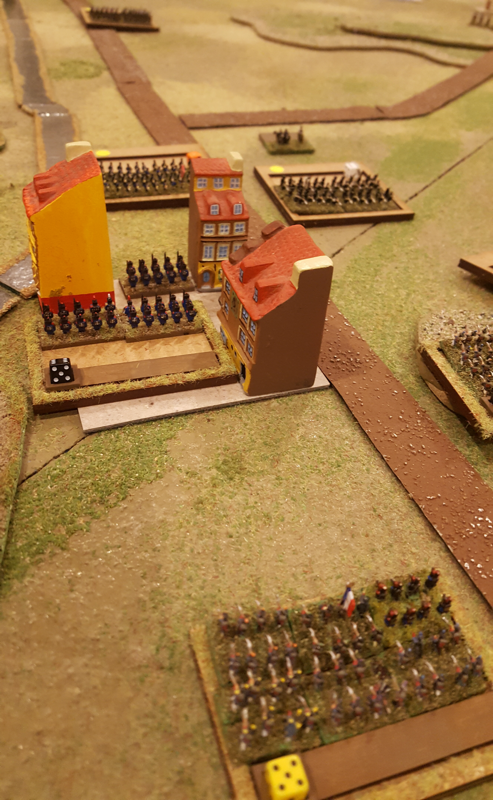 I set out the table using the battlefield of Berestechko, but as it was our first play test the army sizes were considerablyreduced. 2 units of field artillery. 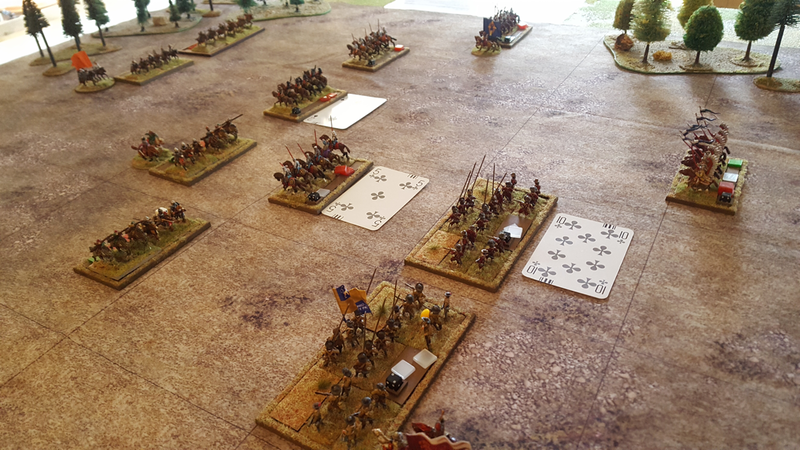 In line with historical deployment, Keith set up his cossack foot on his right, inside the Tabor, with their horse outside and immediately to its left. 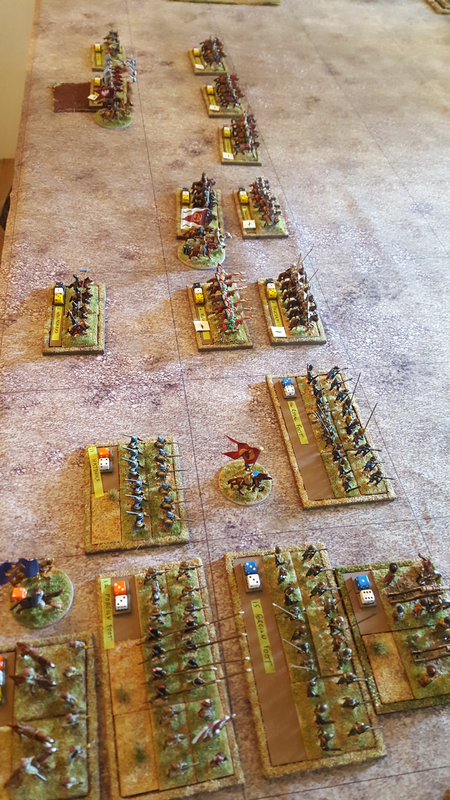 He set up his Tatars on the left, with the bowmen on the far flank and lancers closest to the centre. 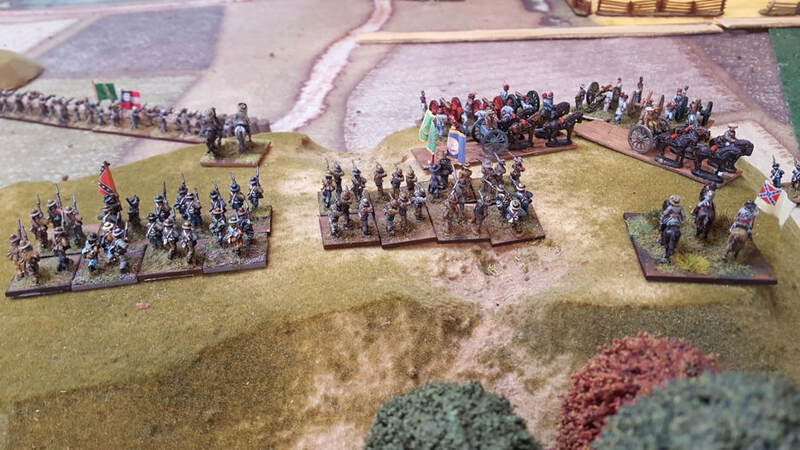 Matt deployed a small command of two Pancerni and the Dragoons on his left; his infantry, artillery and Reiters in the centre and the rest of his Horse on the right. As this was a play test, the point was not to try and win but to test different aspects of the rules. Both players took a few decisions to see what would happen, possibly against their better judgement. Keith in particular wanted to gauge the flexibility of his Tatar troops and they saw the most action of the game. The battle began with Matt advancing his right and centre, while his left observed the Tabor from a safe distance. Keith kept his Cossacks tucked up in the Tabor and advanced his Tatars, with his bowmen looping around on the far left. 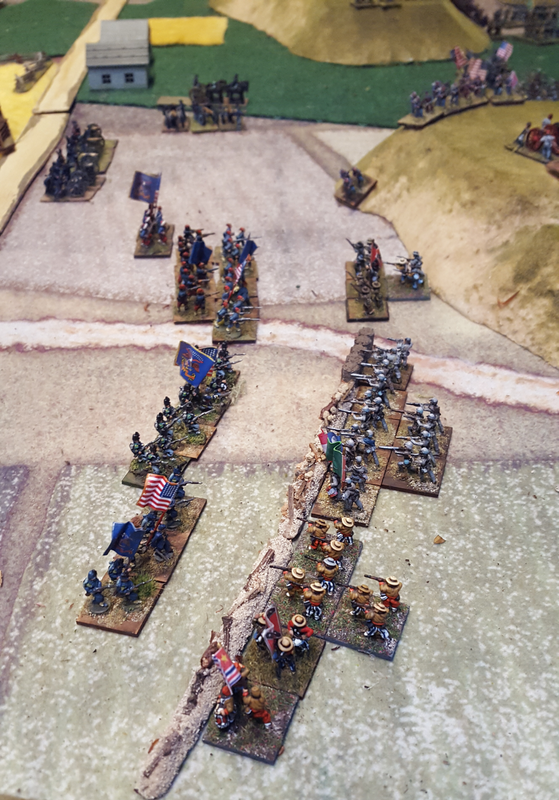 The bowmen were charged by Pancerni but evaded, falling back on the woods to their rear. Keith then decided to see what happened when lancers charged the front of a Pike and shot batallia. Reassuringly, they slid off. Never one to learn from a mistake, he repeated the experiment with another lancer unit, with the same result. The second melee was closer run however, as the Foot had picked up a disorder in the first combat, but the odds were still in their favour. 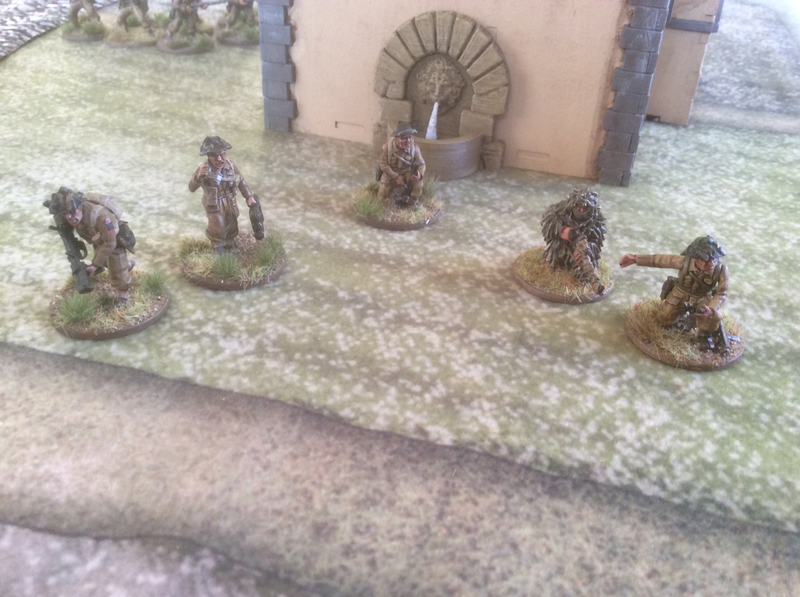 In another combat, Matt’s Pancerni destroyed a Tatar lancer unit in one round. At this point I realised I hadn’t thought about the applicability of the FKaP pursuit rules to Eastern Europe. Uncontrolled pursuit by mounted units was not a significant feature of the dozen or so battles I have read about, although I’m sure it must have happened. We need to think about this but I am tempted to tone down the pursuit rules for games in the East in some way. The battle ended with the collapse of Keith’s Tatar force and death of Islam Giray. As I say, however, this wasn’t really a competitive game but a first chance to try our adaptation. So everybody was a winner, or at least, everybody certainly enjoyed the game. How did the rule adaptations work? First, as we expected, the basic mechanisms of FKaP worked very well for activating and manoeuvring the armies. The Pancerni and Tatar lancers performed as we thought they ought. I was particularly pleased with the way the light cavalry bowmen worked: they were a flexible irritant that kept dancing out of danger but collapsed when cornered. This game didn’t give us a chance to test the resilience of the Tabor as Matt didn’t assault it. In the real battle Wiśniowiecki charged it with his cavalry and was repulsed. We will have to set up a few assaults to see how it fares. Of course we’ll need to play several more test games to get a reliable feel for the whole set of changes. But after one outing, I am very encouraged, especially by the way light cavalry work. One more thing. For King and Parliament is a cracking set of rules: fast, tense and great fun. The next few months are going to be fun. 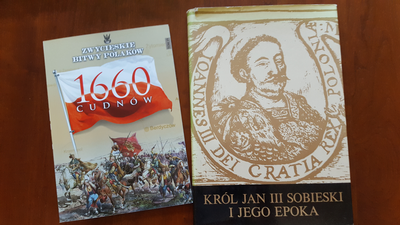 I have set out to adapt Andrew Brentnall and Simon Miller’s ECW rules, ‘For King and Parliament ‘, to cover Eastern Europe and specifically, the Battle of Berestechko, 30 June 1651. 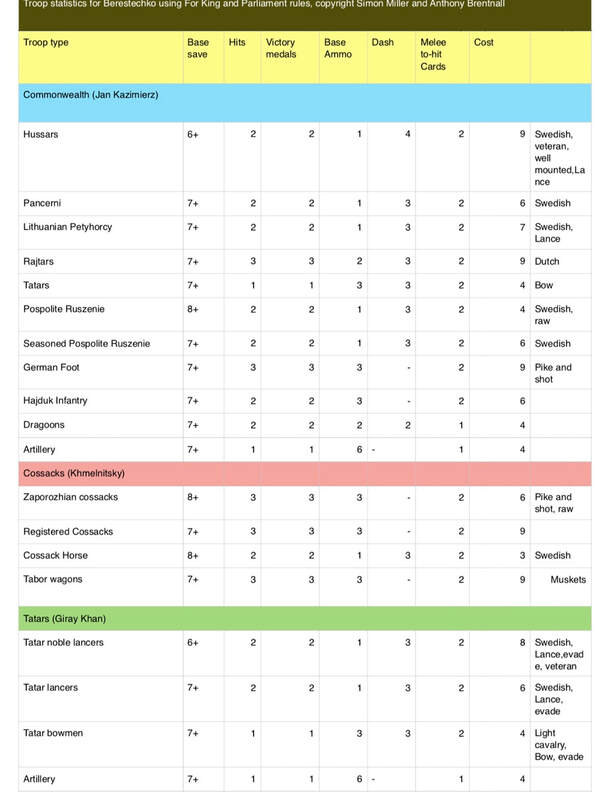 Although some east European troop types are not covered by these rules, most of them are either directly covered or can be represented by equivalent unit stats. The myth seems to linger (in Western Europe that is) that warfare in the East was more ‘primitive’ than in the West, with armies full of lassoo-wielding savages on steppe ponies. It’s true that some specific troop types existed and that in general, the cavalry arm was a bigger proportion of eastern armies than in the West. But most of the troop types present in the Commonwealth armies of the 1650s would be recognisable in a west European force (indeed, many of the troops were recruited from Western Europe) and in wargaming terms, the mechanics and many unit stats in For King and Parliament are applicable with little or no adjustment. The following are my first thoughts about adapting the rules to the East. I will revisit them after a few games. Hussars count as well-mounted, veteran Swedish-style Horse, armed with a lance (conferring a one-off extra to-hit card). This is fitting, given that Gustavus Adolphus had based his new cavalry tactics on those of his fast-charging Polish opponents. Pancerni count as seasoned Swedish-style horse. Petyhorcy count the same, with an added lance. Reiters could be Dutch, or increasingly Swedish as the century progressed. As accounts of Berestechko describe the Reiters as providing fire support in the Centre rather than in the cavalry wings, I am inclined to make them still Dutch in 1651. ‘German’ foot are standard pike and shot units at a 1:2 ratio. Haiduk infantry have the same stats as commanded shot. These troops operated in smaller units than German foot so the original stats can stand. Most were seasoned troops. Dragoons also read across directly, although the Commonwealth used them in great numbers and they were among the most hard-worked troops in the borderlands given their ability to keep up with the cavalry. Some dragoon units had pikemen as well as shot and they could hold their own in the main battle line. There may be an argument to treat some Dragoons as veterans and/or to give them pikes but I amleaving them as standard for now. Artillery also reads across without change. Pospolite Ruszenie are the Polish ‘noble’ levy, summoned by the King in hour of need. These troops were famously unmanageable and of mixed quality. The practice of calling the noble levy would die out over the rest of the century. I have shown them as Swedish style but raw, although they could also be untried. A small number of units, mainly from South and Eastern Poland, were battle experienced and fought well, so these will be seasoned. ‘Registered’ Cossack units represent experienced troops who left Commonwealth service to join the rebellion. They were regarded as some of the best infantry in Europe by contemporaries. I have made them the same size as German Foot but they lack pikes. The Zaporozhian Cossacks are less experienced than Registered Cossacks and so raw, although they do have short pikes. Cossack horse are equivalent to raw Swedish horse. The Zaporozhians were overwhelmingly an infantry army and their cavalry was indifferent. The Tabor is making me think. Cossack armies used their wagons to form temporary fortresses and the Tabor was a key part of their position at Berestechko. We are not talking about a fortified camp behind the lines, but a serious and deep defensive line protecting the front of the army. There were some engagements where the Tabor was attacked on the move. In such a case I would place wagon units on the table with their own factors. I have looked at the rules in To the Strongest for War wagons and have created Cossack unit stats based on them. But the approach I plan for Berestechko is to use the fortifications rule from FKaP. I’ll still place wagon models on the table but this time they won’t have intrinsic fighting powers, as these will go to the infantry units behind them. I will also give Cossack units a cover advantage in all squares enclosed by the Tabor as they drew up further lines of wagons behind the first. I will also hinder movement within this area. The Tatars have three troop types: noble lancers; standard lancers and bowmen. 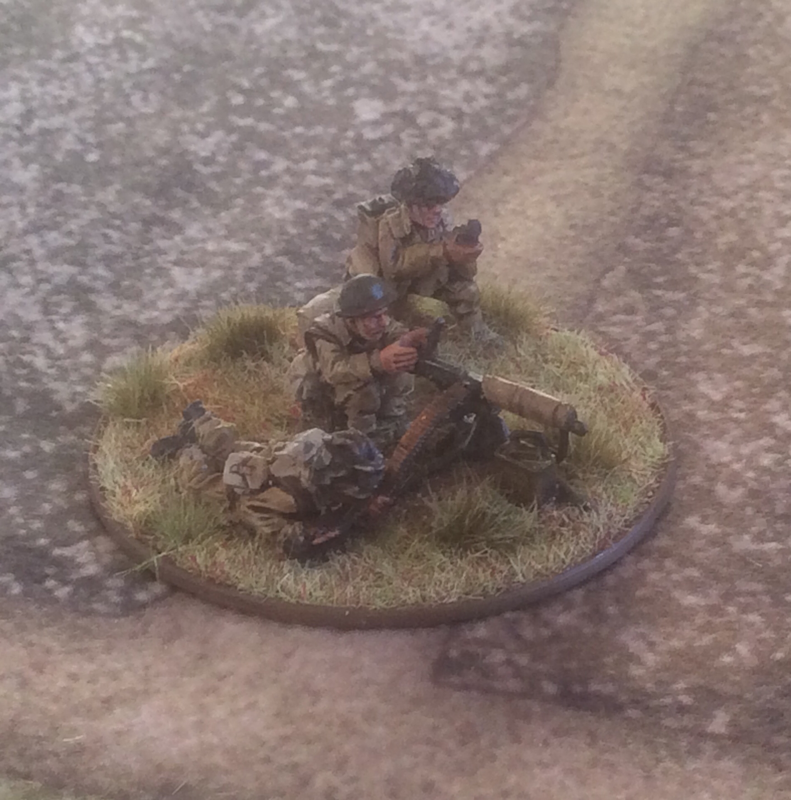 I have snaffled some rules from To the Strongest to cover Tatar troop types and tactics. Light cavalry: All light cavalry activations are considered easy. Light bow armed cavalry may fire and retire one box facing the enemy (as well as the existing movement possibilities in FKaP). Infantry can charge light cavalry (this represents the light cavalry falling back before a steady advance of formed foot. Foot may not charge any other types of horse). 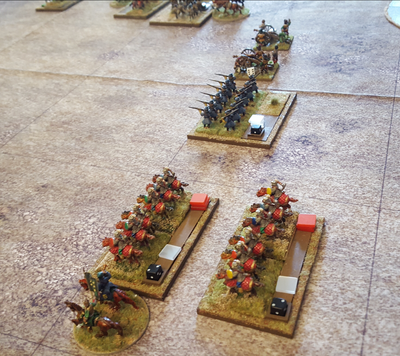 Light cavalry receive a +1 save modifier against shooting, to reflect their dispersed formation. Light cavalry and Tatar lancers have the evade ability. Cavalry with the evade ability may evade charging infantry on a 3+ and cavalry on a 5+. If successful they retreat one box facing the charger. (The Tatars were highly versatile horsemen who used the feigned retreat to lure enemy troops out of formation. I decided to give lancers the evade ability despite them not being light cavalry). These stats are set out in the table below. The points values may be a bit off here and there but I hope they broadly fit. As soon as you scratch one itch, another one starts to bother you. 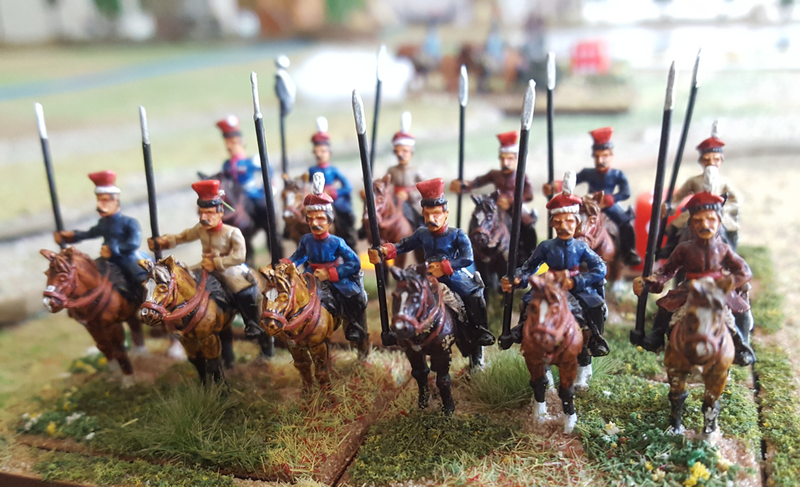 As I was putting away my 1815 Napoleonics the other day my eyes fell on a box of 15mm winged Hussars. It must be 18 months since these lads had an outing. That is far too long a break. The last eastern renaissance game we played was the 1651 battle of Loyev during the Cossack rebellion. My plan at the time was to move on to Berestechko, the largest set piece battle of that year (in fact one of the largest in the 17th Century). So it’s time to pick up where I left off. Nearly half of the Commonwealth army consisted of the ‘noble levy’ (pospolite Ruszenie), who had dutifully responded to King Jan Kazimierz’s summons but who were of mostly questionable quality. The Allies also had a great many poor quality troops, mostly peasants who had joined the Khmelnytsky rebellion but were ineffective in battle. Their fighting troops consisted of roughly equal numbers of Tatars and ‘registered’ Cossacks (that is, organised and mostly experienced foot who had fought for the Commonwealth until the rebellion broke out in 1648). Jan Kazimierz advanced on Khmelnytsky’s army from the West and found it at Berestechko. 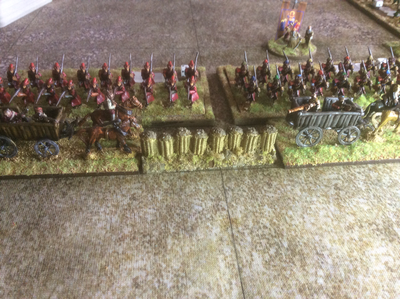 The first day saw inconclusive cavalry skirmishing. The second involved much larger numbers but still only cavalry. The Poles did better on the first day but the Allies had the advantage on the second. On both sides the foot remained in their fortified camps and as a consequence neither day was decisive. After day two, Jan Kazimierz held a Council of War in which he persuaded his generals to adopt West European methods and bring the foot and artillery out of camp and into an integrated battle line. This decision marks an important transition in Polish tactical methods. Day three saw early success for the Polish left, which then became overextended and was sent packing by the Tatars and Cossacks. However the steadily advancing Polish Centre poured fire into the Allied horse and ground it backwards. The Polish right, meanwhile, flatly disobeyed an order to advance as its commander feared a Tatar trap. The pressure from the centre was enough however and as the day ended the Tatars and Khmelnytsky left the field, leaving the Cossack Tabor to its fate. This was besieged for some days by the Poles before the remains of the Cossack army made their escape. The story of how the battle ended is clouded by folklore. A popular version has Giray Khan, the Tatar commander, taking fright at a near miss from a Polish cannon and fleeing the field, taking Khmelnytsky prisoner as he did so for misleading him as to Polish fighting ability. 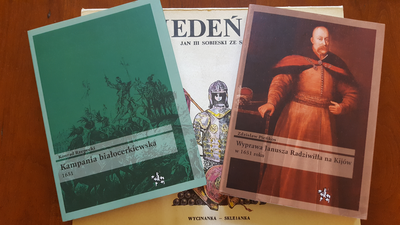 However, Konrad Rzepecki suggests neither of these events seem plausible as Giray was an experienced general who had not shown cowardice before and Khmelnytsky was back commanding troops soon after the battle. More plausible, he suggests, is that the Tatars and Khmelnytsky saw that the battle was lost and withdrew with as much of their mobile forces as they could. 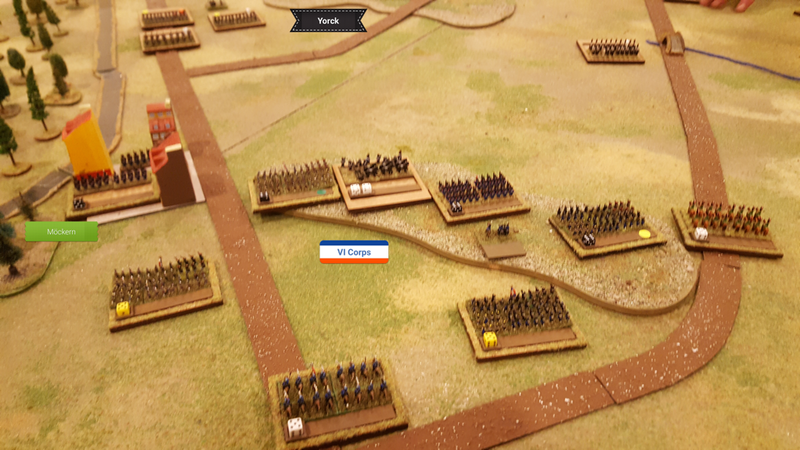 There was little sense in Khmelnytsky locking himself away with his Tabor, which was too slow to escape but could defend itself reasonably well against Polish assault. He could be more effective organising the next force to confront Jan Kazimierz. After the battle the King wanted to go deep into Cossack territory but the pospolite Ruszenie decided to go home, considering that it had done its duty and was no longer needed. Also, soon after the victory Hetman Jeremi Wisniowiecki fell suddenly ill and died, depriving the army of one of its best leaders. The army did continue its advance but in smaller numbers and with less vigour. Further battles were won but the campaign was to end with another inconclusive armistice that once again made further conflict inevitable. 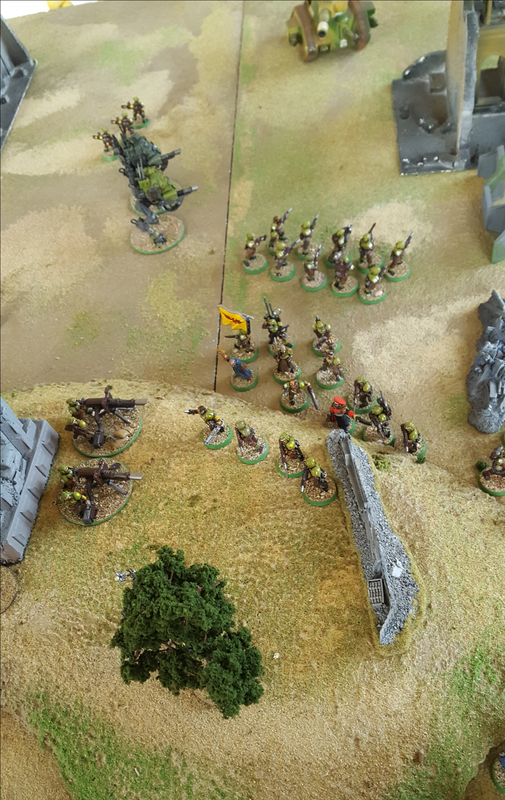 We have used two rule sets so far for this period, Pike and Shotte by Warlord and Tercios by el Kraken. Both have given good games, especially Tercios, but the mechanics are a bit cumbersome for a bigger battle. As Berestechko was such a large engagement I would like to use rules with more of a big battle feel. Enter ‘For King and Parliament’. These rules, by Simon Miller and Andrew Brentnall, are an adaptation of Simon’s Ancient rules, To the Strongest, which I like a lot. They are unusual in their use of a map grid and playing cards. I picked up a copy of FKaP at Salute in April and have yet to play them. They will need a few additions to cover Eastern Europe but fewer than you might expect. I will detail these in my next post.